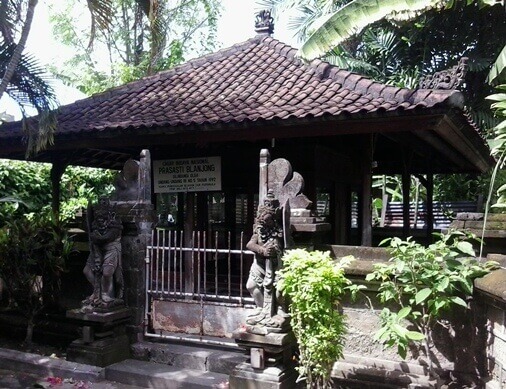 Blanjong temple is located in Banjar Blanjong, West Sanur Village, District of South Denpasar, Denpasar City, Bali. The study says that Blanjong is a port in the south of Bali in the early of 10th century. It refers to several important findings such as Blanjong Inscriptions or Blanjong Pillar, China ceramics, Ganesha statues, calf or "lembu" (Animal Statues), potsherd, fragment of a monument and is supported by the geographical position close to the coastal waters in the southern part of Bali. Most of these findings are currently stored at the Bali Museum at Denpasar City. Blanjong Inscription was established in the year of 835 caka or 913 AD by king Sri Kesari Warmadewa. The inscription was discovered in 1932, in the form of round pillar with a height of 177 cm and has a diameter of 62 cm. At the top there is a lotus flower decoration (petals of lotus). Blanjong Inscription is written using Nagari Script and Kawi Script. The Nagari script using the Old Balinese Language mentioning about a king who defeated the enemy in the Gurun and Suwal named Sri Kesari. The Kawi Script using the Sanskrit Language mentioned the words "Walidwipa" and "Adhipatih Sri Kesari Warmadewa". This inscription is a symbol of victory for Sri Kesari Warmadewa in defeating the enemies. Sri Kesari Warmadewa is the founding father of the Warmadewa Dynasty in Bali. This inscription has remained where it was initially found and is housed in the building with protective glass enclosure and partially covered with devotional cloth. The Blanjong Temple is located next to the enclosure of Blanjong Inscription. In the area of this temple there are ancient artefacts of Ganesha statue, statues of animals (calf), and the monument. In addition to this very sacred temple, the relics in the area are very attractive, especially in terms of archeological and architectural. The archeological discovery of Ganesha statue and statues of animals (calf) can provide us information regarding the social-life at that time. 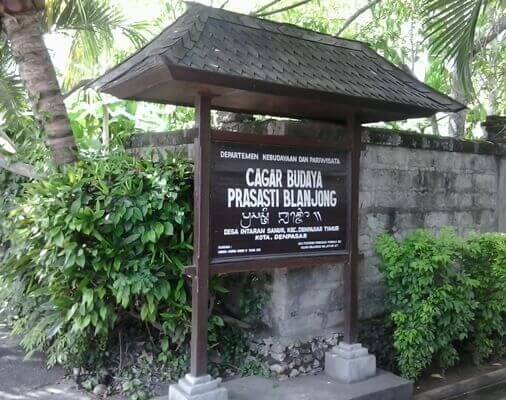 It also can be associated with the discovery of similar objects in other locations in Bali, as to reveal deeper information about the social and cultural life embraced by society at that time (Ancient Era). The beauty of the architecture can also be seen on the building shaped like a monument in the northeastern part of the area Pura Blanjong. 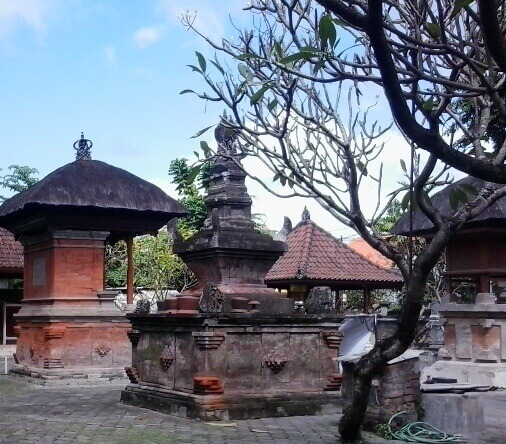 The building has a slightly different shape than the temple building or padmasana that commonly encountered in Bali. This unique monument has a shape that is closer to Candi Architecture in Indonesia. The base of square and the top of the pyramid-shaped with a beautiful ornament decoration as well as the petals of lotus in the middle part(in a simple form). However it has a different crown design compared to candi, monument, temple or padmasana. Crown design on this monument is closer to the style of temple architecture in India namely Brihadeeswarar Hindi Temple in Thanjavur in the Indian state of Tamil Nadu (in a complex form called Vimana). The basic concept of the square base known as the Mandala concept (grid system). 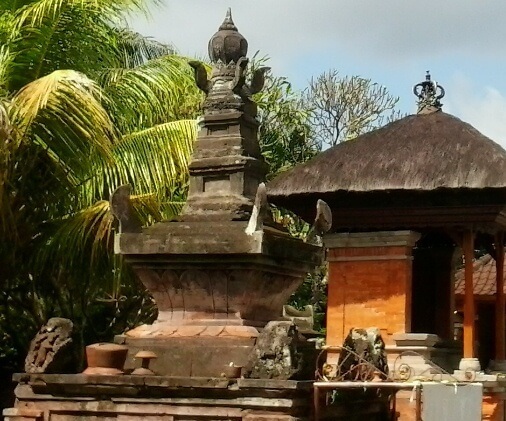 This concept is found in The Old Balinese Architectural Style known as Asta Kosala Kosali. In India known by the name Vastu Shastra. The Mandala concept is closely related to the geometry and golden ratio (gnomonic expansion). The square base of the building or grid system or Mandala is also used as guiding element for designing the elevation of the building with perfect proportions (golden proportion), the beautiful decorations as well as where the ornament have to be placed. Please note here! To be honest, I have interest in geometry and this geometry (golden ratio, gnomonic expansion or golden proportion) is only assumption with a simple observation from the monument in Blanjong Temple Sanur. There are no sources mentions about it or I have not found it yet. But in Bali there is an ancient Balinese architectural style called Asta Kosala Kosali which has the geometry concept and Mandala. Of course it needs a further study and research to open the information and create a brighter view. Regardless, this monument is very sacred, unique, rare, and beautiful even in a simple form. Thank You!